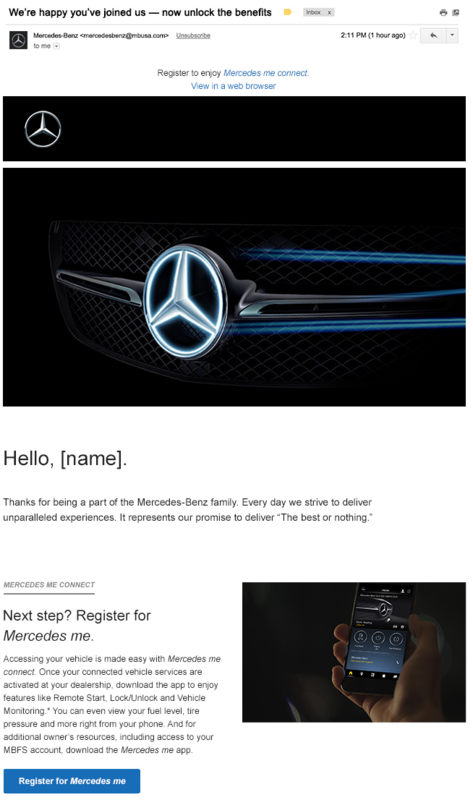 Winning the Email Hero Award for Best Email Series, this week we’re featuring Mercedes-Benz USA! 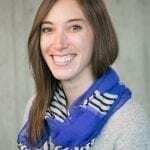 To understand what went into this award-winning campaign, we interviewed Victoria O’Neill, Senior Full-Stack Developer assigned to Mercedes-Benz USA, LLC. Historically, Mercedes-Benz digital communication strategy focused on speaking to the VIN, not the consumer. We provided customers with information about their car, without recognizing their unique history with our brand, thus flattening the highly contextualized nature of ownership into a one size fits all experience. The New Owners Welcome Series sought to challenge this long embedded strategy by providing each customer with the most relevant, streamlined, and personalized communications based on their history with our brand and not just their newly purchased vehicle’s attributes. In particular, we sought to create a communication journey that could be tailor fit to each customer, not just today, but in the future as well. There were several technical roadblocks that we had to overcome, such as siloed data sources in need of amalgamation. As well as the migration from legacy IT systems whose design and infrastructure seriously prevented us from achieving our goal of delivering personalized and curated content at a standardized cadence within the ownership lifecycle. Additionally, we faced multiple interpersonal challenges with various business teams throughout a lengthy messaging consolidation process. In particular, we found it more difficult than we anticipated, aligning stakeholders from very disparate business areas on a communication strategy that involved forgoing long-established, legacy communications that were often duplicative in messaging, in favor of a more consolidated, customer-centric approach. Consolidation of more than a dozen separate communication streams into a single journey, comprised of three core emails, and four possible follow up emails delivered only to customers meeting specific criteria. As a result of the streamlined communication strategy, we now deliver our initial welcome communication within 24 hours post purchase, netting out to a 96.67% improvement in response time to what is the most significant event of the customer lifecycle. We have thus far, succeeded in reducing the average number of days post purchase that it takes a new owner to add their VIN within our mobile app, Mercedes me, from 23 days to 10 days. The path to achieving the goals of the New Owners Welcome Series started with a concerted effort by Mercedes-Benz to improve our overall rate of email deliverability. We wanted to ensure that each email of the New Owners Welcome Series would actually arrive in a customer’s inbox. Return Path played an integral part in helping us optimize our deliverability metrics and improve our Sender Score. Prior to launching the New Owners Welcome Series, we used the Return Path platform to monitor the success of our efforts to “warm up” brand new IP addresses from which we would send the New Owners Welcome Series. Return Path helped us improve our overall deliverability rate from 86.08% in 2017 to 95.03% in 2018, a 10% increase in deliverability rate year over year.